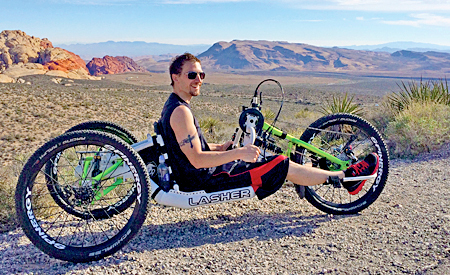 Lasher Sport All Terrain Handcycles are much more than off-the-shelf handcycles with fat tires. 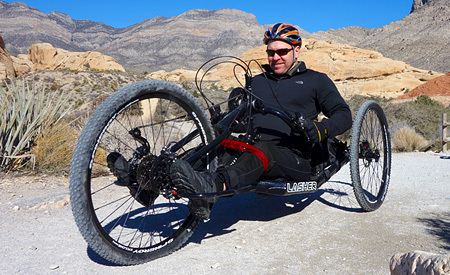 Pioneering the recumbent style all terrain handcycle, Lasher Sport cycles come standard with a super strong magnesium frame and high quality components. 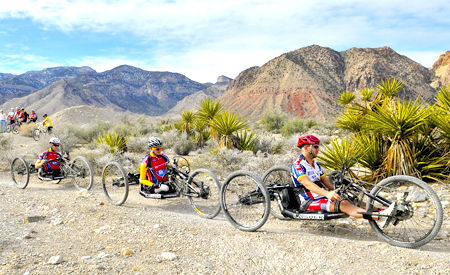 These rugged recumbent bikes are specifically designed for off road adventures, yet still ride smooth on pavement. 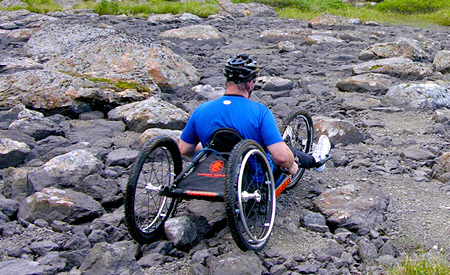 With two robust models and a comprehensive menu of customization options, these All Terrain Handcycles are too smooth to pass up. 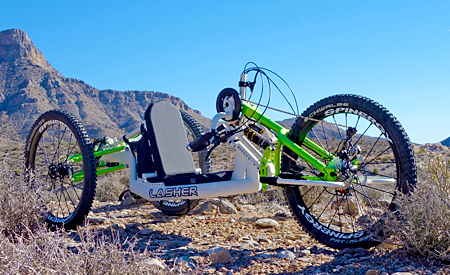 The Lasher Sport All Terrain Handcycle is fully loaded and ready for back country adventure. It is specifically designed for off road use, yet still handles well on pavement for the urban rider. Six generous inches of ground clearance help you conquer rough trails and gnarly terrain and provide enough leeway to pop up or drop down a standard curb when biking in the concrete jungle. 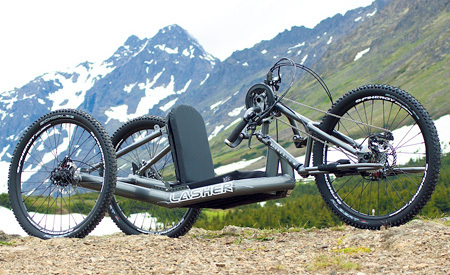 The ATH frame is built with custom extruded magnesium for maximum durability and the forks and backrest are constructed with tough 6061-T6 aluminum. 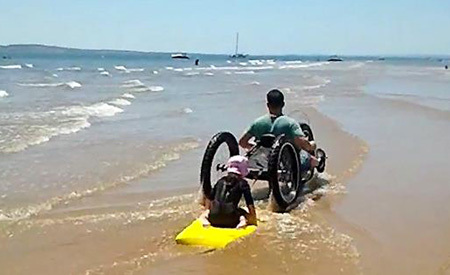 The seat back connects to the axle with dual adjustable supports for additional triangulated rigidity and premium component upgrades are available for personal customization. 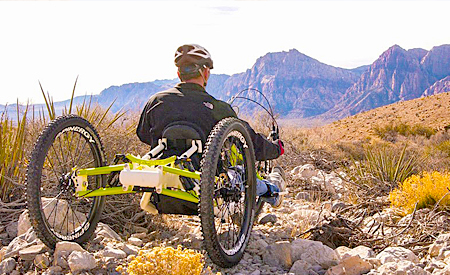 The ATH-FS is a rugged full suspension handcycle with a durable magnesium frame and Fox Shox absorbers on all three wheels. 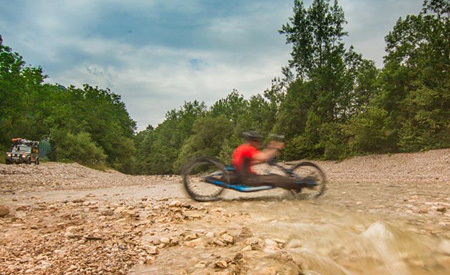 It is specifically designed for off road adventures and offers a unique patent pending front fork shock design that provides a smooth ride even in the most demanding conditions. The ATH-FS is fully loaded for back country action and available in three high performance models. 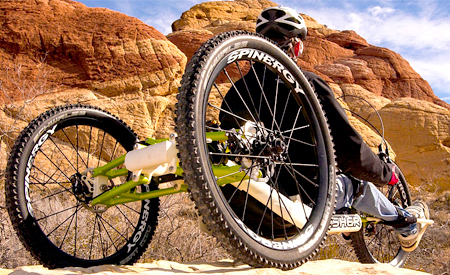 26" wheels come standard, but 27.5", 29er, and Fat wheel set upgrades can be added to any model. Fox Shox shock absorbers provide superior all wheel suspension for the dedicated off roaders. * Weight depends on configuration. See individual order forms for full component options.